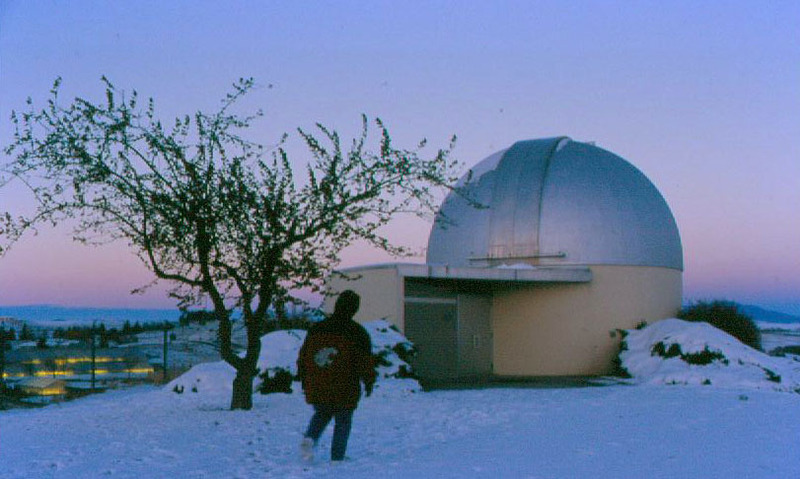 The James Richard Jewett Observatory of Washington State University has as its main instrument a 12-inch-aperture Alvin Clark & Sons refracting telescope with an Alvan Clark & Sons equatorial mount. The tube is 15 feet long, and still features the original lens polished in 1887-1889 by the elder Lundin, the same optician that fabricated the world's largest (40-inch) lens at Yerkes Observatory. Jewett Observatory, August 2003. This is a night-time, 10-second time exposure. Note the temporary tar patches on dome, and the bright light in the sky and on the north side of dome. Martin Stadium was not lit at the time. The red light in the dome slit is real, and comes from red light fixtures inside. Clicking on pictures anywhere in this page will zoom in to bigger, more detailed pictures. 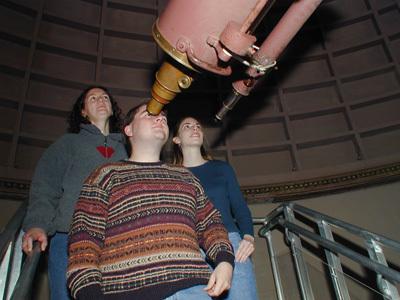 Jewett Observatory. The date of the picture is unknown, but it is also a night-time time exposure. The lack of light from the north direction indicates a lack of light pollution from the greenhouses and/or Martin Stadium. The main lighting that casts shadows on the building is probably from a gibbous moon. The juniper bushes are very small compared to today. I'm guessing this picture was taken between 1965 and 1975. 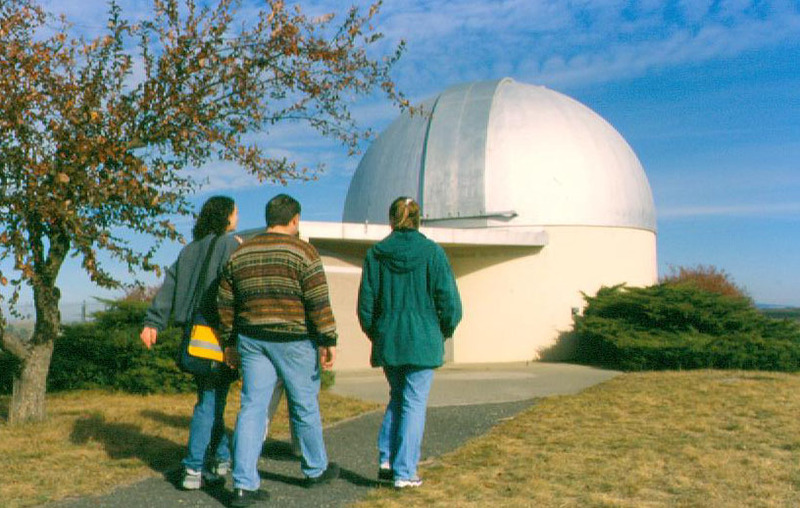 The philanthopy of Mr. and Mrs. George F. Jewett of Spokane made the project possible, and it was named after George's father James, a professor of Arabic at Harvard, and a "friend of astronomy for many years." The portrait of James Richard Jewett donated by his son (right) stills hangs in the observatory. In 1929, Washington State College's Professor Harry H. Irwin completed the polishing of a 12-inch mirror and constructed an alt-azimuth mount to hold it. This telescope was placed on the roof of the building now called Carpenter Hall. 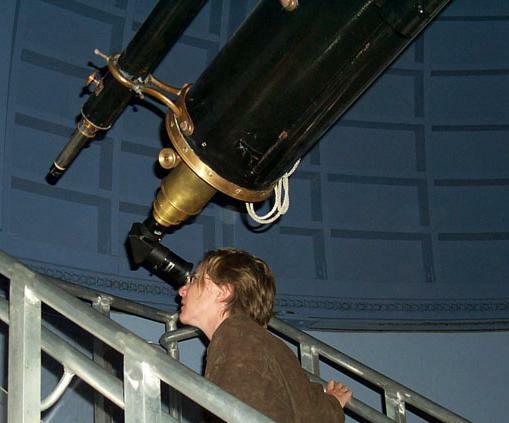 This telescope was used for many years, but fell into disrepair during world war 2. 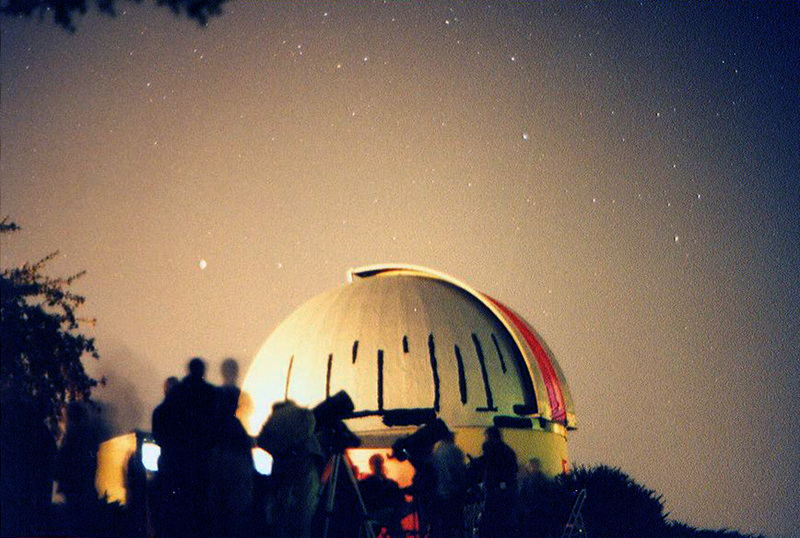 In December, 1948 Sidney G. Hacker of the mathematics department (under which astronomy was organized) proposed to President Wilson Compton a joint Observatory-Planetarium complex. In the spring of 1948 the Department of Architecture and Engineering had an Advanced Design course, during which three students made designs and models of their proposed structures (the students were Walter N. Brown, Thomas Grenfell, and Chester Lindsey). The complex as envisioned by the students was never built, for monetary reasons. George F. Jewett Sr. was former president of Potlatch Lumber Co., and had become wealthy. At about the time President Compton was appealing to his friends the Jewetts for funding this enterprise (the first appeals generated no enthusiasm on the part of the Jewetts) a contact of Prof. Hacker's, Leon Campbell of Harvard, informed him of the availability of a 12 inch achromatic lens. This is the lens that now resides here at WSU, made by Lundin of the Alvan Clark & Sons Co. when it was the leading telescope manufacturer in this country, if not the world. This lens had been made for an amateur astronomer who died shortly after the lens had successfully passed essential optical testing in 1889. It had passed the years since in the vault of a Boston bank, but now later heirs wished to sell it, at a price of $2400, which, even then, was an exceptional bargain. As it turned out, the elder Jewett, James Richard, Harvard Professor of Ancient Languages, had been an ardent amateur astronomer who had had a long friendship Leon Campbell. George Jewett remembered these facts fondly and decided to donate $24,000 for the observatory project. Serious obstacles remained before the observatory became a reality. The Alvan Clark Co. was no longer a thriving institution, and only by finding a retired technician, H. F. Gage, who knew how to find the necessary parts in the clutter of old machinery that littered the place, was it possible to complete the mount for the lens. A price of $8000 to the Alvan Clark Co. was negotiated through Prof. Campbell. Location was another obstacle, as the limited budget seemed to require rooftop installation, but no one found this very aesthetically appealing. Eventually, a bare-bones but separate structure was elected on the perimeter of campus; the present site. 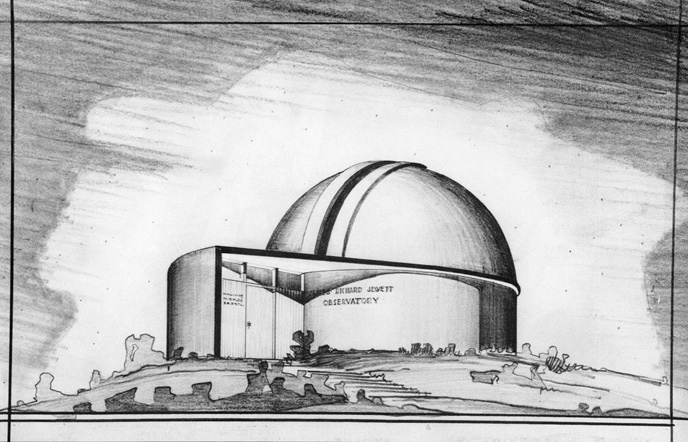 Architect's pencil drawing of the design for Jewett Observatory. Poster for the 1953 dedication ceremony. Architects Mr. Philip E. Keene and Mr. Glenn W. Wegner of the College Architect Office began designing the structure in 1950, with advice from astronomers, including Henry Norris Russell. It proved difficult to get a bid on the dome, and no company showed interest in a steel-and-aluminum structure. Finally, Timber Structures, Inc. of Portland became intrigued with the dome as a "challenging research project" and offered to build it out of a wooden framework sheathed by molded plywood at a very modest cost. At about this point, it was realized that expeditures would exceed the Jewett's $24,000 gift, but George Jewett offered to increase the gift to $35,000. With funding in place (again) the project seemed to have momentum, but President Compton abruptly resigned (April 1951) and Leon Campbell passed away. As Prof. Campbell was the principle liason with the Alvan Clark Co., it was feared that the work on the mount would stop. Sidney Hacker was able to get the help of Harvard Observatory's head instrument maker, Walter Locke, to step into Campbell's shoes, and the instrument was eventually (early 1952) tested and put in readiness for shipping. Another major component of the building, the steel-and-aluminum shutter, was built by General Machinery Co., who also built the motors that rotate the dome. The wooden dome cost roughly $2400, the shutter and motors roughly twice that amount. The building itself was contracted to H. Halverson, Inc. of Spokane for $15,500. The telescope arrived to a fully ready building in June 1952. Prof. Hacker notes that among the curious observers of the assembly of the telescope was cosmologist H. P. Robertson, there on a personal visit to the area. The official dedication was on May 14, 1953, before a capacity audience in Todd Hall Auditorium, with Mr. and Mrs. Jewett and President French in attendance. 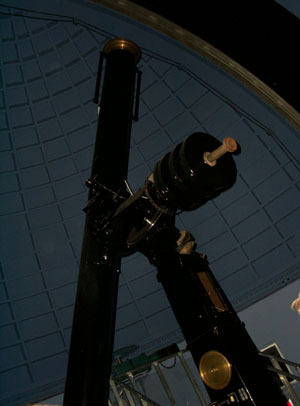 A lecture was delivered by R. M. Petrie, director of the Dominion Astrophysical Observatory. (See poster at right). The color of the telescope has changed over the years. Smithsonian magazine article about the Alvan Clark & Sons refracting telescopes. The tube is 15 feet long. The dome has an inside diameter of 25 feet. - Guy Worthey, with copious reference to "Origins of the J. R. Jewett Observatory and of the WSU Planetarium" by Sidney G. Hacker, 1980, Mathematics Notes, Vol 23, No. 23. This article has been scanned: page 1, page 2, page 3, page 4, page 5, page 6.